The story arc of the book is simple. 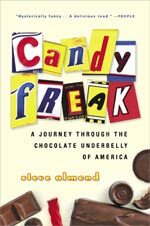 In an autobiographical account, Steve travels to the some of the last remaining, independently owned candy manufacturers that serve as alternatives to the big three of Hershey, Mars, and Nestle. Readers follow him from Pennsylvania to Idaho to California sampling Peanut Chews, Idaho Spuds, and various Annabelle products. There is a greater point to the work. The underlying atmosphere of it is actually rather dour. Steve is journeying to all these factories because he is depressed; candy serves as his sole marker for happier times of his childhood, and he sets out on his spontaneous journey more of a way to cope with his sadness by retreating to something that once brought him joy than for just the pure love of candy documentation. As a candy enthusiast and as a writer, I was torn by this work. One half adored this work for its history and introduction to many pieces of candy I have never known; the other felt the ultimate conceptualization of the work was too blatant, and a subtler execution of the driving plot would have sufficed. Either way, there is just something compelling about the metaphors of a man who writes about how he would give up his possessions to try a Caravelle bar again or recount his ascetic father spoiling himself with dark chocolate. I loved this book too. I have a particularly soft spot in my heart for the retro, regional candy brands, and Candy Freak told their story and their value in a great way. Marathon bars!!! I miss the heck outta those. This book is great. I read it a few years ago, about the time I discovered Candy Addict. Word to the wise–make sure you have some delicious, delicious candy to eat while reading it.